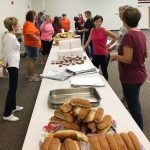 On Saturday, October 6, the Women’s class along with the Youth of East Dillon Baptist Church prepared and distributed 150 hot dog meals to people who were affected by Hurricane Florence. 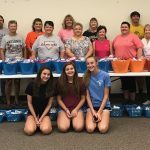 Baskets of items including toiletries, diapers, and cleaning supplies were also distributed. 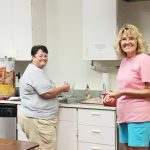 Teams went to the parts of Dillon that were hit the hardest and distributed plates of food and talked to people about the love of Jesus even through the difficult times. Thanks to all who made this event possible with their donations of food, water, cleaning supplies and toiletries. A special thanks to Mr. Kenny Rowell and Mrs. Kelly McNeill for having the youth available to help, Mr. Rocky Brunson, who cooked the hot dogs, Mr. Glenn Hyatt, Mr. Kenny Rowell, and Mr. Phillip Brunson who offered their trucks to help distribute the food and supplies. We would also like to thank the Charleston Rotary Club for their generous donation of gift cards.